There has been a noticeable shift in social thinking and group action since September 2015 when the Lunar Nodes moved into Virgo/Pisces where Neptune has been for several years. 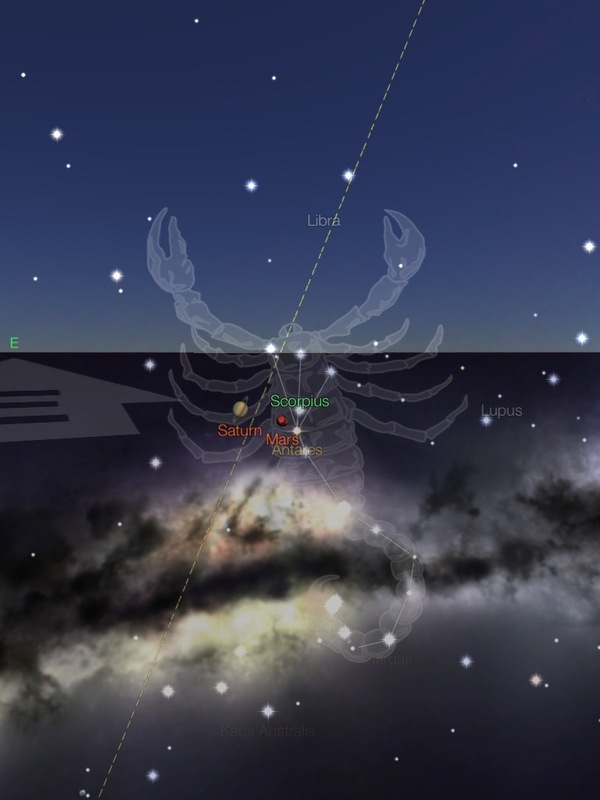 Then Saturn moved into Sagittarius and a bit later, Jupiter moved into Virgo. These movements from Cardinal signs into Mutable signs have created a real shift in group and social thinking. 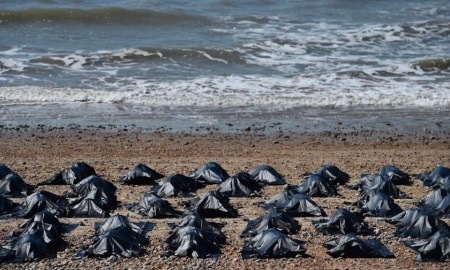 After years of civil conflict in Syria, suddenly the public started to care about the death of refugees crossing the Mediterranean with the picture of one small boy lying dead on the beach. In September, the British elected a strong Liberal in Corbin. Then Australia did the same and so did the Canadians. The power of mass media has been able to transform passive neglect into social action. 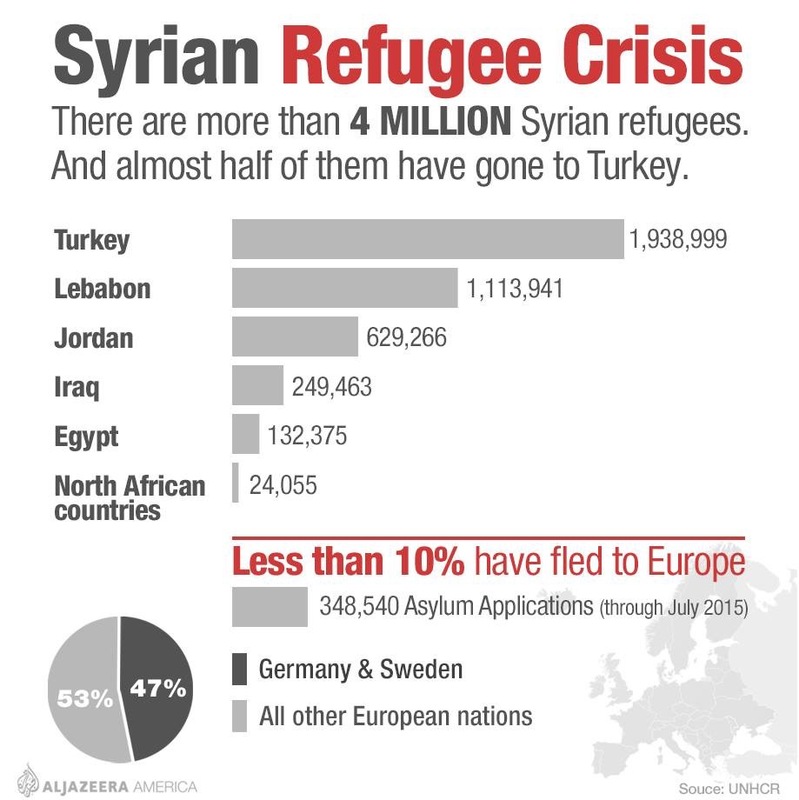 Germany promised to take in one million refugees and the USA promised 10,000. But this issue had been going on for years! Why now?? Because the Lunar Nodes and Jupiter had moved into Mutable signs in the Fall of 2015. Then Saturn moved out of Scorpio and joined them along with Mars. We had the first of three Saturn square Neptune in Mutables starting last December 2015. These planetary movements have changed the social dialog and attitudes. 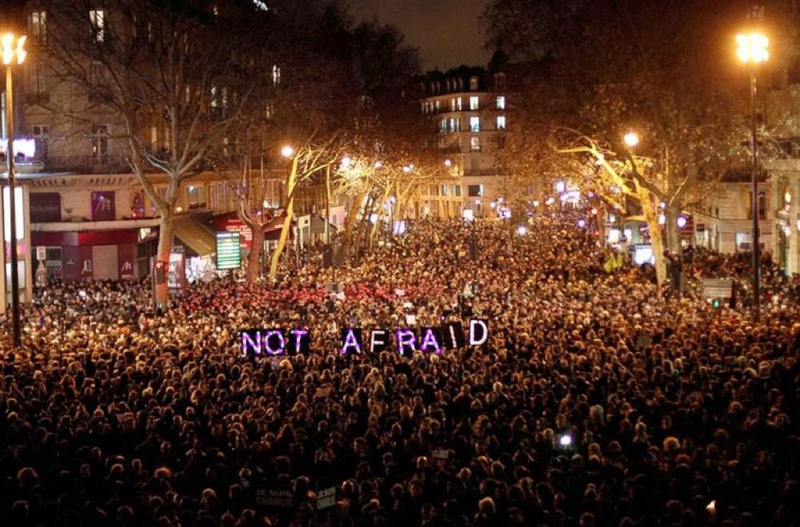 The Paris Massacre in late 2015 and the Brussels Bombing occurring in February 2016 got a different social reaction that was defiant. Now in the summer of 2016 we are seeing bigger social movements for change than we have since the late 1960’s. Mass murders in the name of Islam (Neptune sq Saturn) have increased around the world along with more socially ill-adjusted individuals committing more mass murders of strangers. 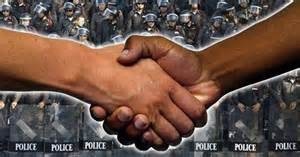 The social protests from the summer of 2014 over the Ferguson murders by police have re-emerged this summer into a bigger social movement. The slower change is usually when Neptune is in Mutable for many years to give time for social attitudes to change but then the drama to motivate actual change needs the lunar nodes and other planets like Mars to change complacency into protests of action. To pass legislation and change laws, there is generally a dominance of planets in Mutable needed. This was the same pattern in 1964-66 when President Lyndon B Johnson declared War on Poverty in 1964 and got the Education Bill passed and signed in January 1965, Medicare in April 1965 and the Voting Rights Act in August 1965. 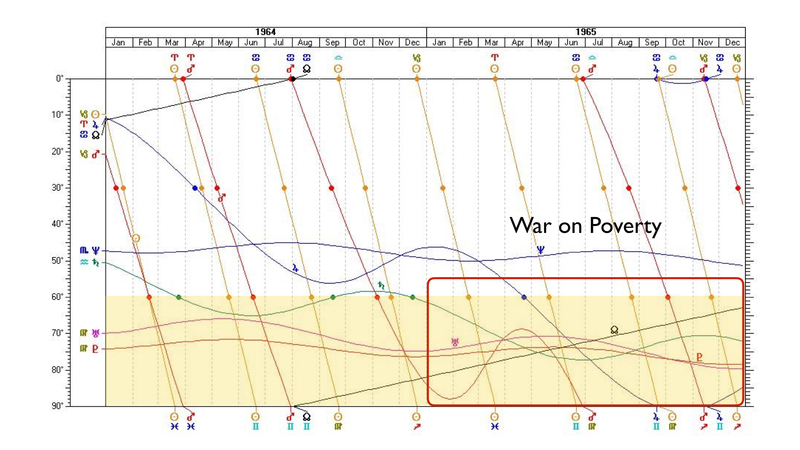 Note on the graph below that in 1964 Saturn entered Pisces and the Lunar Nodes entered Gemini/Sagittarius in August 1964 when President Johnson declared War on Poverty. All of his major bills were passed when Uranus and Pluto were in Virgo, Saturn was in Pisces, Jupiter entered Gemini and Mars went retrograde in Virgo creating an extended stay in Mutable in 1965. The Mutable Cross is the only one of the three zodiac crosses that is 100% Mutable. The Cardinal Cross and the Fixed Cross mix Individual and Family signs together. The Mutable Cross is made of only the Social signs. Pisces-Virgo and Gemini-Sagittarius are the two axes that create the Cross. The four of them work together to create social order that is kept in place or creates change. Let’s look at the 90-deg chart below that clearly lays out this change into Mutable from the end of 1964-65 when President Johnson’s social bills were passed into law. There was an incredible cluster of slow and fast planets in Mutable signs when these laws were passed. In 1964-64, Saturn was in Pisces opposing Uranus and Pluto in Virgo. The north Lunar Nodes were in Gemini from the fourth quarter 1964 until first quarter 1966. There was a Mars Retrograde period in Virgo from November 1964-April 1965. Jupiter entered Gemini in 1965. Johnson announced the War on Poverty on February 26, 1964. His Education bill was signed on January 12, 1965, Medicare on April 8, 2965 and the Voting Rights Bill on August 6, 1965. The protests against Viet Nam and the Black Power and Black Pride movements with race riots peaked in 1968. More social change happened between 1969-70 starting with Women’s Liberation Movement, EEOC and Eastern religions coming West with yoga that was influenced by the Beatles. Neptune entered Sagittarius (1970-84). Saturn, Jupiter and Uranus were in Virgo. Mars was retrograde in Pisces with the lunar nodes in Pisces/Virgo. The shaded yellow areas are all Mutable signs with planetary transits. The other great change in the USA social structure occurred in the middle of the Great Depression (1929-1936) when President Franklin D. Roosevelt was elected in 1932. He took office in 1933 and passed massive social legislation to ease the social pain of a massive depression. The first New Deal was from 1933-34 and the second New Deal was from 1935-38. 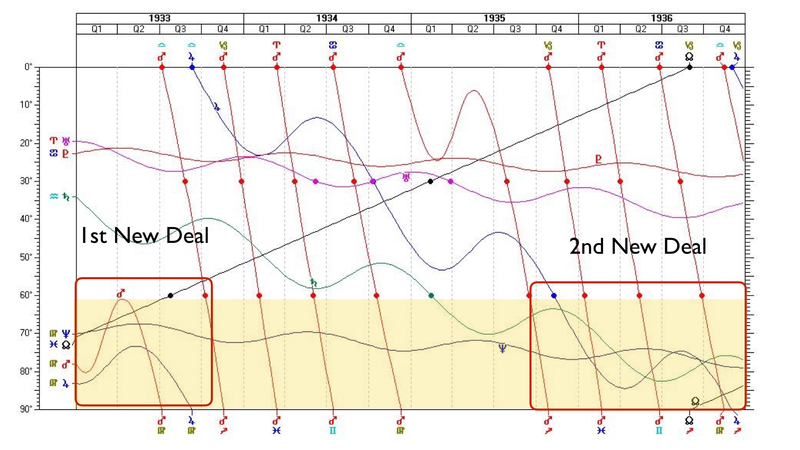 Look at the graphic chart below for 1933-34. 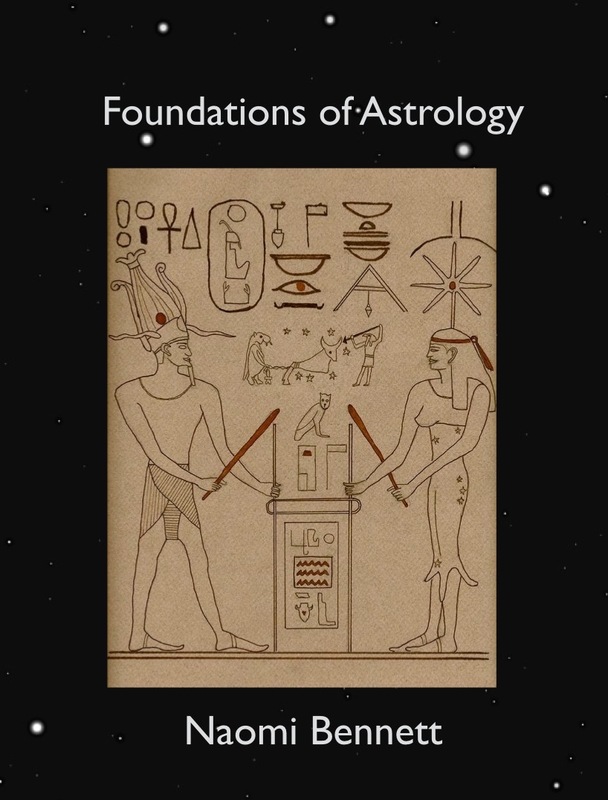 The lunar nodes were in Pisces/Virgo, Saturn was in Pisces, Jupiter was in Sagittarius and Mars was in Virgo. 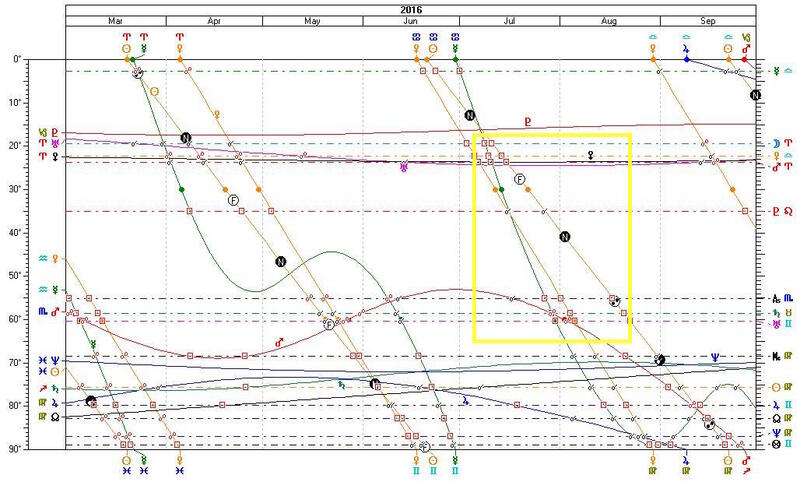 The shaded yellow area are all Mutable signs with planetary transits. Now let’s look at 2015-6 and the current Grand Mutable Cross of this year. This time Neptune has been in Pisces since 2011 setting the tone of sympathetic change. It wasn’t until after it moved into Pisces that social opposition to gay marriage began to change. Legalization of marijuana laws have been changed in over 25 states and three have totally legalized it. Canada and Mexico are moving in that direction too. The social under class of groups that are considered abnormal, non-conformist, artistic, criminal, defiant or weird have long been associated with Pisces and its ruler Neptune. Oil and drugs fall under Pisces along with popular music and mass psychology like riots where people let the crowd dictate the action as a whole. Saturn has moved in to Sagittarius permanently in August 2015, the fiery sign of social change for the future, making laws needed for change. 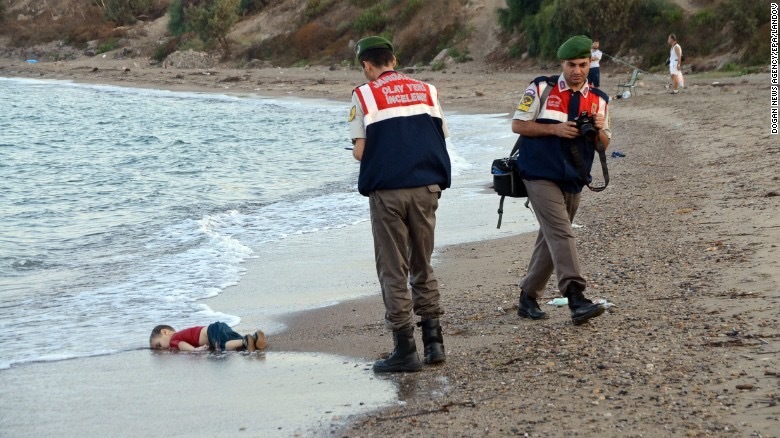 Suddenly during the eclipse period of August-September 2015, the world cared about Syrians. Jupiter moved in Virgo for a year staring last July. Here is a call for social structure to accommodate immigrants now with much resistance from stable countries. Then the lunar nodes moved into Virgo/Pisces to add more momentum to the social earthquake of 2016. Lastly Mars entered its retrograde period into early Sagittarius, back to late Scorpio and returning to Sagittarius from the spring to the fall. 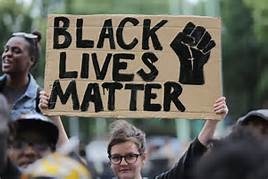 Now matters have heated up with the rise of anti-immigrant feelings, Black Lives Matter movement because of police shootings. The counter attack on police officers this July occurred as Mars was stationary which intensified the violence in groups and individuals. The rise of Brexit, Bernie Sanders and Donald Trump are all cries by the population for dramatic change of how large groups of people are treated. The corruption of governments and financial institutions has caused a massive call by whole populations to break the mold and bring in radicals (like Trump, Bernie Sanders or Corbin in the UK) to force change. Now a major combination of Saturn and Mars squaring Neptune is forming in mid-August. Mars will be Out of Bounds in early Sagittarius that should produce excessive energy. Then the lunar nodes come into alignment in Virgo/Pisces. A lunar eclipse starts an eclipse period on August 18th, a Solar Eclipse on September 1st, a Moon Wobble (Sun conjunct the lunar nodes) on September 4th and finally a lunar eclipse on September 16th to close out this period. 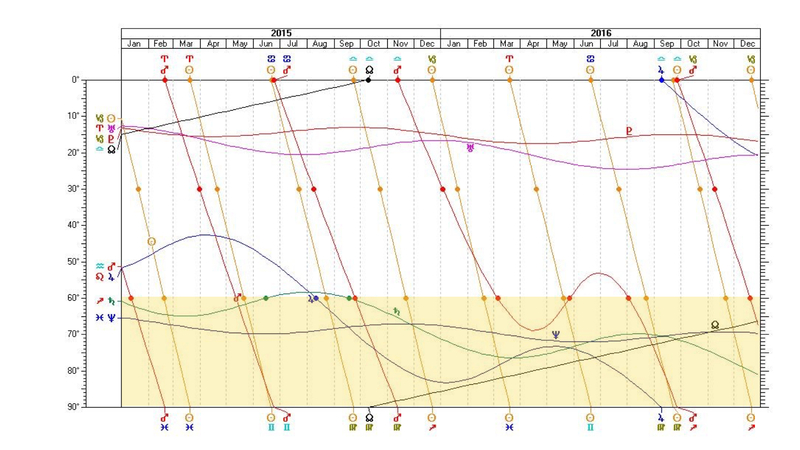 This eclipse period is stronger than usual since it falls on the square of the heliocentric nodes of Uranus (14 Gemini/Sagittarius) which is known for surprises and the unexpected. It is the north node of Uranus in Gemini that forms the final leg of this Grand Square in Mutable. I would expect fireworks near the first lunar eclipse when Saturn and Mars will be aligned on August 23-24th. It is this time period that can change the direction of our social structure and the coming elections. It has a signature of scandals, exposure of hidden secrets and the possibilities of another financial panic. August strongly affects Bernie Sander’s chart that indicates that his campaign is over and that he is likely to change the course of his life. It is the ending of a major period of his life but he had a great run. Are there more scandals like the Panama Papers to hit the news? Is the propping up of the financial markets going to fall or collapse again when the Federal Reserve have no more moves left? This is an exciting period of social change that is coming to an apex moment very shortly. As of late July, Bernie Sanders announced that he is leaving the Democratic Party. He is severing his ties which fits his double Mars-Uranus transits. See this post from Fox News. Bernie has transiting Uranus conjunct his Mars and transiting Mars squaring his Uranus in early August. This is an aspect of termination, a change of direction, a letting go of what was. He is done with this part of his life. Thank you for this excellent analysis and historical recount of events. sono d’accordo sull’interpretazione della quadratura di saturno in sagittario e sul cambiamento di natura sociale che esprime la croce mobile. Goggle translate from Italian to English: I agree on the interpretation of squaring Saturn in Sagittarius and changing social nature that expresses the moving cross.